A handcrafted felt ornament sure to bring cheer to the thorniest humbug. 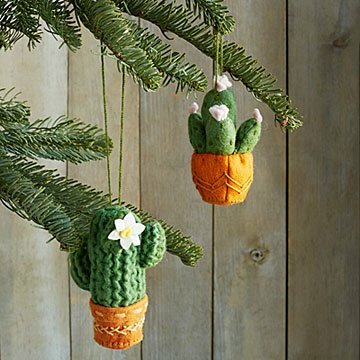 Pine trees aren't the only kind of greenery that can brighten your holidays: Hang this cuddly soft, felted saguaro cactus ornament from your Christmas tree, or plant it as unforgettable trim on a gift, and you're sure to bring cheer to the thorniest humbug. You can also find it a perfect spot to put down year-round roots, dangling from a drawer pull in the kitchen or catching rays in a sunny reading nook. Crafted from locally sourced wool by artisans in the villages of Kyrgyzstan.